Our lovely feral cat Suki was put to sleep today…..she was suffering from throat cancer and the past two week have been difficult for her….we finally managed to capture her (for she was a ‘wild animal’) and took her to the vet yesterday……she died peacefully this afternoon and we brought her back home for burial. 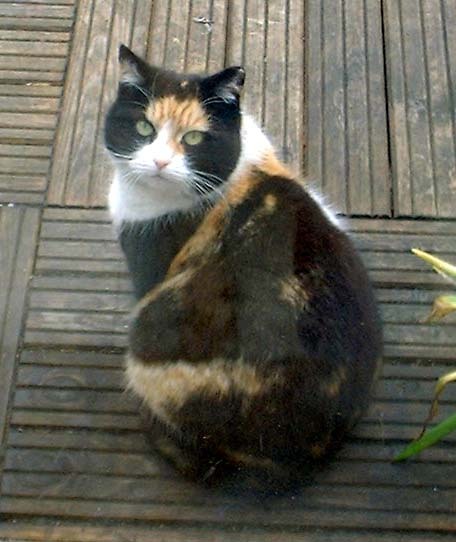 Suki was a gentle soul, a timid and quiet feral who came to visit us over 14 years ago and has been with us ever since. In all that time she never got close to us, you could never stroke her as you would a domestic cat and she lived in her little cat house outside in the garden. She was every bit the wild animal who would run at every tiny movement you made. She was very much a cats, cat and made friends easily with our two other cats Rosie and Nanni and would play happily for hours in the garden…the three of them gallivanting around in a joy for life. 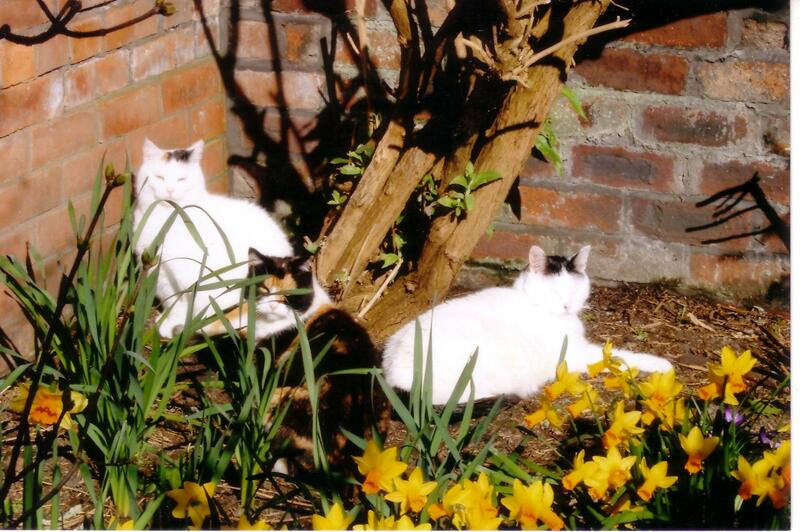 Rosie, Suki (in the middle) and Nanni enjoying the spring sunshine! 16 Feb	This entry was published on February 16, 2010 at 5:39 pm. It’s filed under cats and tagged 2010, animal domestic, battle, cat, cats, died, feline, feral, greiving, liverpool, pet, pets, philip, suki. Bookmark the permalink. Follow any comments here with the RSS feed for this post. Older: A new blog record…….. Newer: Tread softly least you tread on my dreams…….. So sorry to hear about your Suki. She was VERY lucky to have someone who loved her like you guys did. My Mamita was just diagnosed with throat cancer which is how I found your site. Mamita is about 14-15 so she’s lived a nice, long life but I’m heartbroken. I’ll be giving her lots of love in whatever time she has left.